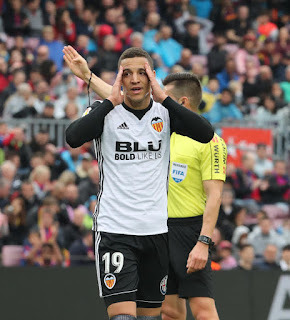 Valencia CF: F.C. Barcelona 2-1 Valencia C.F. F.C. Barcelona 2-1 Valencia C.F. Whenever we play Barcelona, especially when we play at the Camp Nou my first hope is that we do not get overrun and beaten by a high score. It never happens in the league but I still get concerned. Today again, we gave a good account of ourselves and proved it is no fluke that we are up near the top of the league. We surprisingly started again without Murillo with Vezo taking the right back position and Garay and Gabriel centre defence and Gaya on the left. Soler was retained on the right with Kondogbia and Parejo central with Mina up front with Rodrigo. Barcelona were looking to break the La Liga record of 39 games unbeaten and had put out a strong team as can be expected. 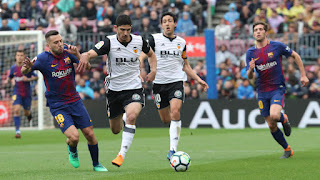 Valencia started lively enough with Guedes and Gaya causing all sorts of problems for the home defence and Pique was soon booked for pulling back Guedes when he was on a run. Unfortunately Kondogbia was booked soon after for a robust high tackle. On minute 15 Valencia went behind when a great through ball from Coutinho found Saurez who tapped home from a tight angle. Maybe Neto could have done more to keep it out but now it is 1-0. Soon after Gudedes was unlucky with a shot that was just wide. Then it was the turn of Rodrigo after a poor clearance to bring off an incredible save from Ter Stegen to push his hard drive onto the crossbar. Rodrigo could have had at least 2 goals with a bit more lethal finishing but it was not his day. In the second half both teams were swapping blows and goal chances were made at both ends. Then Rodrigo again was thwarted by Pique clearing a goal bound shot almost off the line. It was not going to be our day today. 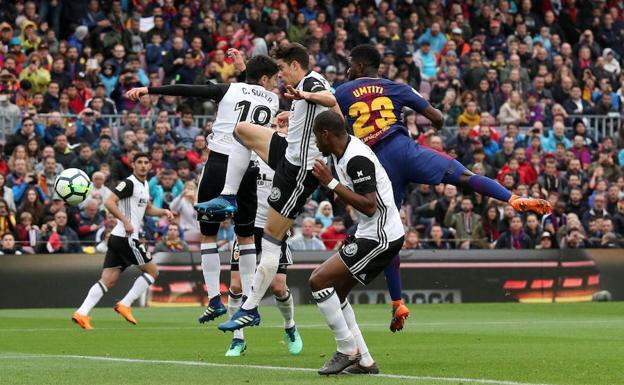 Goal 2 came after 53 minutes when, of all people Umtiti, got to a corner first to beat Gabriel in the air and Neto at his near post again for his first of the season. Maybe everybody was concentrating on Pique and forgot about him. Four minutes from time Gaya was fouled in the area by Dembele and Parejo stepped up to take the kick. His low shot was hit home rather luckily as Ter Stegen seemed to have it but it squirmed under his body. It was no more than Valencia deserved for the opportunities they they had. On another day it was a game we may have won had we taken all the chances that arrived. Maybe though a 2-1 defeat was perhaps a fair reflection on the game as they also had opportunities which with either poor finishing or good goalkeeping kept the score down. All in all, not too disappointing IMO we gave a good show and already we are almost guaranteed Champions League so not too worrying. A win on Wednesday against Getafe should lift any bad feelings about the defeat. Yellow cards for Kondogbia and Gabriel means that they will miss the game on Wednesday. Another important fact is that this season we have failed to beat any of the other top 3 teams although have picked up creditable points at home to Barca 1-1 Away to Real Madrid 2-2 and away to Athletico Madrid 0-0. Neto 5.5 Made some good saves but maybe could have done a bit better on the goals he conceded. Vezo 6.0 I always want him to play well and today he defended very well as usual. Unfortunately his ball out still leaves a lot to be desired and he gave away silly passes when he had time to pick out his man. Both goals conceded came from the other side. Garay 6.5 Played his usual confident game and did not make any errors that I can recall. Gaya 7.0 Solid performance and he is really back to his best form now. Worked well with Guedes down the left. Soler 5.5 Again another disappointing game and maybe he is distracted by a possible summer sale, If so he needs to concentrate or he will be going nowhere. Kondogbia 8.0 Anything Parejo can do I can do better. Difficult to choose between them but Kondogbia wins it for me. He was everywhere winning balls and laying off passes. I wonder if he will be sold for silly money in the summer. I hope not but they all have a price. 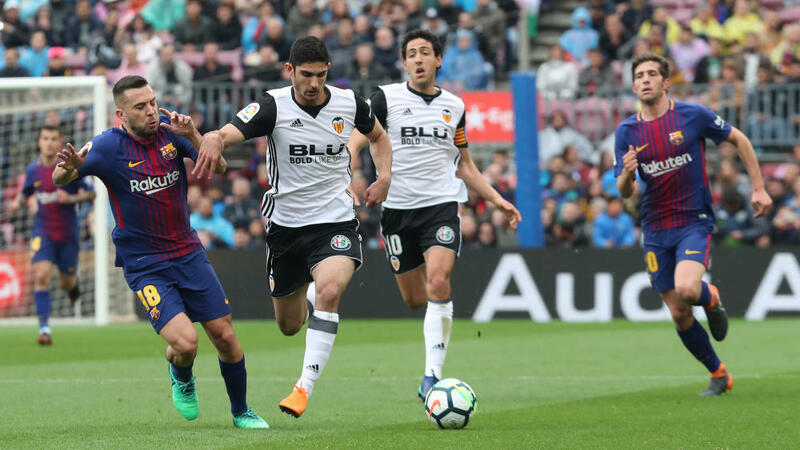 Guedes 7.5 Another outstanding performance and unlucky not to have scored a goal or two. Getting back to last years form now. Rodrigo 7.0 Do you score him low for missing chances or high for being there and making them and working hard. Could have had 2 or 3 goals today and maybe should have had. Mina 4.5 Poor performance and back to his old self of falling over all the time and mis- controlling the ball. A long way off being good enough today.